Words by Kevin Doocey on June 11, 2011 . There are reports swirling around both Twitter and a few radio stations that we have signed Demba Ba for a minimal amount. The Senegalese international is supposedly a free transfer now after a clause in his contract was triggered, seeing him become a free agent courtesy of West Ham’s relegation from the Premier League. I’m sure most of us will have noticed that he scored a nice few goals in his time at Upton Park and tried his best to keep them in the top flight. In fact, he scored on the day they were relegated from the Premier League - helping them into a two goal lead at the DW Stadium only for Wigan to come back and secure a dramatic 3-2 victory. I for one would like to see Demba Ba at Newcastle United because I think he has the ability to grab a fair few goals a season, especially with Yohan Cabaye behind him! I remember the day I saw that Stoke City were closing in on his signature and I was quite disappointed because I had a feeling that his talents would not be appreciated at the Britannia in any shape or form. However, that move broke down due to a failed medical, Ba’s knee which caused serious concern for Stoke City manager Tony Pulis. Only lately, there were more reports that the strikers knee could be one injury away from ending his career - and we wouldn’t want that to happen on Tyneside, as we’ve seen that kind of stuff too many times before. If we could keep him fit, and indeed manage to sign him up on a free transfer with average wages: then it will be a very good deal for Newcastle United. He can score goals that’s for sure, and we certainly need reinforcements up front. He is a risk, but I’d be willing to take that risk as he’s still relatively young at 26 years old. Providing he looks for normal wages, and we have some sort of clause in the contract so that we don’t get screwed if his knee explodes then I say why not? pay as you play deal i hope! We have bad luck with injuries injuries so the chances of his knee plaing up are quite high I'd say but he seems like a player and free so seems good business. So what if 1 month into the new season he gets injured and is out for several months or worse? Will we be relying on Shola//Loven and Best? I hope we are after another first rate striker to mitigate that risk, and perhaps with a view to 442 at home against weaker opposition. Ideally top class, or worse case an up and coming circa 21yr old who looks like he can make it. Playing Ben Arfa or another midfielder up front in that scenario is not ideal. 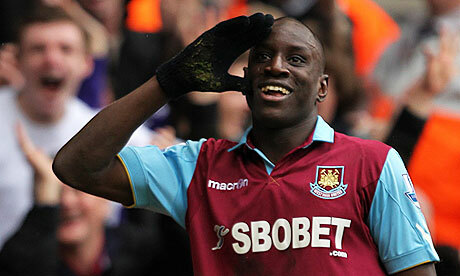 Good player you will love him up there Good Luck Demba, Cant blame him for leaving ! Goos luck next season Toon army ! IF and i mean IF we have the misfortune to lose Ba, He will light up the Prem with a solid team behind him. But unfortunatly for you lot its all twitter lies and bulsh*t and Ba will still be a Hammer next season.....All the best regardless and hope to be playing you soon. I'm pretty sure Demba Ba is a free agent now after a clause was triggered when West Ham were relegated, seeing him leave the club for nothing. Coming from a west ham fan, he is a great player and will immediately be a crowd pleaser up there! But, he said he was not going to decide on his future till he was back from holiday. It's all happened way to quick in my honest opinion.